The 2019 CWAS "David Malin Awards"
The Museum of Applied Arts and Sciences and Canon Australia. The CWAS AstroFest is teaming up with Astrovisuals to produce a 2020 astronomy calendar of images from this year's CWAS "David Malin Awards". Images for the calendar will be picked from the shortlisted and winning entries. 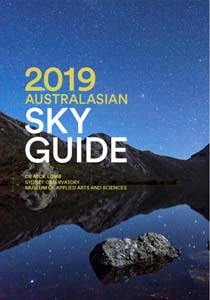 The Museum of Applied Arts and Sciences is once again conducting a competition to choose the cover image for the 2020 edition of its Australasian Sky Guide. The cover image will be chosen from the shortlisted winning images of this year's CWAS "David Malin Awards". Be sure to get your entries in by the close of submissions on Friday, 31 May, to qualify for this prestigious opportunity. The Central West Astronomical Society is proud to announce the 2019 CWAS Astrophotography Awards judged by Dr David Malin - the "David Malin Awards". Click here to see the Conditions of Entry. This year's competition continues to build on the experience of previous years to help make it the premier competition of its kind in Australia. The competition this year will have three sections of entry - General Section, Open Themed Section and a Junior Section (18 or younger). The general section is divided into five categories; Wide-field (camera shots), Deep Sky (telescope shots), Solar System, Nightscapes and Animated Sequences. The Animated Sequences category has two subsections - Scientific and Aesthetic. The Junior Section will have one open category and entries can be of any astronomical subject, and can be an animated sequence. 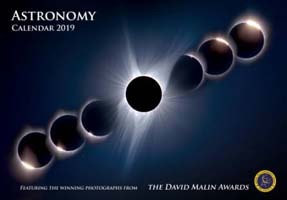 Open Themed Section - "Memories of Apollo"
The "David Malin Innovation Prize" may be awarded, at Dr Malin's discretion, for a striking astronomical image that shows exceptional imagination, innovation or an unusual approach in any of the categories. An additional prize, "The Photo Editor's Choice", will also be awarded. This will be judged by a major news organisation's photo editor or editors. The Solar System category is for images of solar system objects taken with a telescope. Wide-field solar system shots may be entered in the Wide-Field or Nightscape categories depending on the subject and composition. The Nightscapes is intended to showcase the increasing popularity and evolution of this relatively new genre of astrophotography, combining beautiful foregrounds with a night sky scene - often in a single exposure (HDR is OK) or as a multi-shot panorama. Animated Sequences should be videos that are intriguing or highlight concepts and events not obvious or significant in stills. Astrophotographers are invited to submit animations, produced as either time-lapse sequences or with other forms of video. They can be of any subject, provided there is a distinct astronomical link. This category will have two subsections - Scientific and Aethestic. Scientific animations are short sequences that have an obvious scientific purpose, perhaps changes in the appearance of a planet, comet or other celestial body, or where the footage was used for the timing of a transit, an occultation, or even in studying dome seeing. These sequences usually require great skill and/or perseverance in first obtaining the data and then in collating them to reveal an aspect of scientific merit. Aesthetic sequences are animations that are aesthetically pleasing in some way, where the use of appropriate music and editing is encouraged, but always with a strong astronomical component. Scientific animations should be silent and be less than one minute in duration. Aesthetic animations must not exceed two minutes in runtime. All animations must be submitted as MOV, MPEG, AVI or MP4 files. The Open Themed Section is open to all astrophotographers. They are encouraged to see who can be the most inventive and creative in evoking the theme, which this year will be "Memories of Apollo". In a year celebrating the first Apollo lunar landing it seems appropriate to involve the Moon in our 2019 theme. But how? That is up to you, but ideally with a memorable image that in some way reflects the great adventure of Apollo and which evokes the inspiration and awe that people experienced at the time and since. The intention is to encourage people with vision and creativity, perhaps using simple equipment, such as a tripod and ordinary camera, to make striking images of the Moon that evoke the memories of the Apollo missions. All entries must be images that faithfully reflect and maintain the integrity of the subject. Entries made up of composite images taken at different times, different locations or with different cameras are not acceptable. Image manipulations that produce works that are more "digital art" than true astronomical images, will be deemed ineligible. All still images must be submitted as digital files via a dedicated web site that can be accessed at this web address. For judging purposes, still images must be submitted as JPG files with the longest side having a dimension no greater than 4,950 pixels. All images must be in Adobe 1998 RGB colour space and will be judged using a calibrated monitor. Similarly, winning images will be printed from the files as-received, so it would be prudent for entrants to calibrate their monitors if possible. It does make a difference. Click here for an example of a very detailed set of calibration procedures for all platforms. For Mac users, a useful monitor calibration program can be found under "Monitors" in System Preferences, and the ideal solution for monitor calibration is a stand-alone device such as the Spyderexpress. Submission of entries will be accepted from Monday, 1 April 2019, and will close at 24:00 (AEST) on Friday, 31 May 2019. Entrants must register in advance. This can be done from 1 April from the Submit Entries link on this page. Entry payments can be made by cheque, money order or direct deposit. For the entries to be accepted, the payments must be received by the deadline. Entry fees are $15 per entry. Payment details will be presented following each entry submission. The photographs will be judged by world-renowned astrophotographer, Dr David Malin. During the course of the judging process, Dr Malin may invite, at his discretion, the views of other distinguished international astronomers to aid him in his deliberations, with Dr Malin's decisions being final. All entries will be judged without David being aware of the identity of the photographer, and to preserve anonymity, the submitted image files should not contain identifying metadata. The winners will be notified and presented with the "David Malin Awards" during a special ceremony held at the CSIRO Parkes Observatory in the presence of invited dignitaries on Friday, 19 July 2019. All winners are required to make every effort to attend the presentation of the awards. A selection of the finest astrophotographs received will be professionally printed courtesy of Canon Australia by Sunstudios and exhibited for the entire year at the CSIRO Parkes Observatory's Visitors Centre. In addition, a second set will tour the country in a travelling exhibition, organised by the Museum of Applied Arts and Sciences, to selected venues beginning with Sydney Observatory in August. There is a limit of five (5) entries per category per photographer. All photographs must have been taken no more than 2 years before the closing date of entry, and no re-entries from previous DMA competitions will be accepted. All entries must be submitted in electronic form via the dedicated submissions web site. The entrants must provide brief details of the equipment, exposure times, processing and, where relevant, the location where the image was taken. It is not just technical skill that David Malin will be looking for, but an aesthetically pleasing picture that reflects and captures the beauty, inspiration and interest of astronomy. All images will be judged by these criteria. Canon Australia is supporting the competition with significant prizes. Presentation Ceremony for the 2019 CWAS "David Malin Awards"
6:00pm Friday, 19 July 2019. Entries close at 24:00 (AEST) on Friday, 31 May 2019. 1. Entries will be accepted only from Australian residents of the COMMONWEALTH OF AUSTRALIA and its TERRITORIES. For clarification, see the ATO website. 2. There will be three sections of entry - General, Junior (18 or younger) and an Open Themed section. 4. The Junior section is for photographers 18 years old or younger and will have one open category (can be any type instrument or astronomical subject). 5. The Themed section is open to all astrophotographers regardless of background. The theme for 2019 is "Memories of Apollo". 6. An additional prize, "The David Malin Innovation Prize", may be awarded at Dr Malin's discretion, for a striking image that shows exceptional imagination, innovation or an unusual approach. 7. There is a limit of five (5) entries per category per photographer. 8. In the case of images with multiple authors, the instigator of the image will be considered to be the principal author and the one who "owns" the image. The principal author MUST have performed the majority of the work to produce the image. All authors MUST be identified and named in the entry form along with their contributions to the production of the image. 9. Entries that combine images from professional observatories, taken by professional astronomers, for purposes other than creating the entry in question (e.g. the Digital Sky Survey), will be disqualified. 11. To preserve anonymity, the submitted image files should not contain identifying metadata. 12. For judging purposes, still images must be submitted as JPG files with the longest side having a dimension no greater than 4,950 pixels in Adobe 1998 colour space. Animated Sequences must be submitted in MOV, MPG, AVI or MP4 file formats and must not exceed two minutes in runtime for Aesthetic entries and one minute for Scientific entries. 13. All photographs must have been taken no more than 2 years before the closing date of entry, and no re-entries from previous DMA competitions will be accepted. 14. Entry fees are $15 per entry and should be paid by cheque, money order or direct deposit. 15. If entry payments are not received by the deadline, then the submitted entries will not be accepted for judging. 16. After notification, the winning images must be supplied on request as TIFF files in Adobe 1998 RGB colour space for professional printing. The longest side should have a dimension of about 4,950 pixels. 17. The winning entries will be exhibited for the entire year in the CSIRO Parkes Observatory's Visitors Centre. In addition, a second set of images will tour the country in a travelling exhibition, to selected venues. 18. Permission to reproduce entries for publication to promote the competition and exhibitions will be assumed as a condition of entry. The copyright of the image remains with the author, and we will try to ensure that the author is credited where the image is used. 19. All entries must be true images, faithfully reflecting and maintaining the integrity of the subject. Entries made up of composite images taken at different times and/or at different locations and/or with different cameras will not be accepted. Image manipulations that produce works that are more "digital art" than true astronomical images, will be deemed ineligible. If there is any doubt about the acceptability of an entry, then the competition organisers should be contacted, before the entry is submitted, for adjudication on the matter at the following email address: dma@cwas.org.au. 20. If after the judging process, an image is subsequently determined to have violated the letter and/or the spirit of the rules, then that image will be disqualified. Any prizes consequently awarded for that image, must be returned to the competition organisers. 21. Submission of an entry implies acceptance of all the conditions of entry and the decisions of the competition judge. 22. The competition judge reserves the right to reject any entry that, in the opinion of the judge, does not meet the conditions of entry or is unsuitable for public display. The judge's decisions will be final. 23. Submissions close at 24:00 (AEST) on Friday, 31 May 2019. No entries will be accepted past this date. 24. All winners should make an effort to attend the presentation of the awards on Friday, 19 July 2019.